you an error (such as: There is not enough free space on the drive, or similar.) Does this sound familiar? individual file may not exceed 4GB. down this page for the instructions on how to change the file system. settings quite a bit to make them work with the NTFS drives. them over to the hard drive or some other drive. 6. Make sure to select NTFS in the File System drop-down list. That’s what determines the kind of a file system that the drive should have. Also, you may want to select the Quick Format option, which should speed up the formatting process quite considerably. larger than 4GB to the drive just fine. that the conversion process would keep the existing files on the drive. See Windows Help and Support of your computer for the instructions on how to do the conversion. 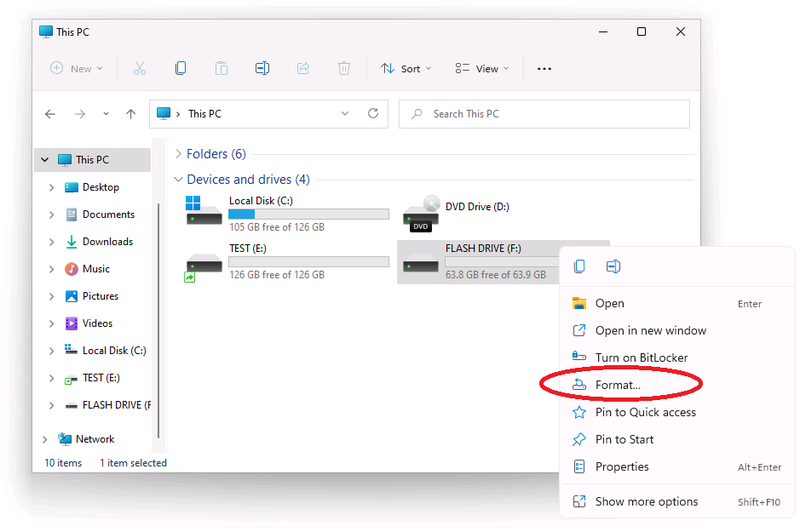 What if I want to use exFAT instead of NTFS?The steps to change to exFAT are the same as for NTFS, you only need to select exFAT in the dropdown box instead of NTFS. put inside of the Virtual Encrypted Disk. See the USBCrypt web page for more information or to download a free 30-day trial. Windows computers should work fine.